Fashion is fickle and so are the style trends in the world of golf. While many famous players like Payne Stewart and John Daly were renowned for their colorful and decidedly eclectic ensembles, today the fashions are more focused on smart slacks, striped shirts and splashes of color. Gone are the days of eye-watering plaid pants or tacky tartan trousers, the golf look of today is all about preppy chic. Here are a few rules to consider when dressing for a day on the fairway. A golfer’s wardrobe should include classics with a fresh twist. A flat brim hat, square sunglasses or graphic short sleeve polo elevate old-timey golf garb and give it a dash of modern playfulness. A Submariner with a date is a great watch that will be perfect for your golf appointments. Even the trendiest golfers will need a closet full of the basics. A V-neck vest, flat front khakis, slim chinos and a wool sweater are part of the required uniform. 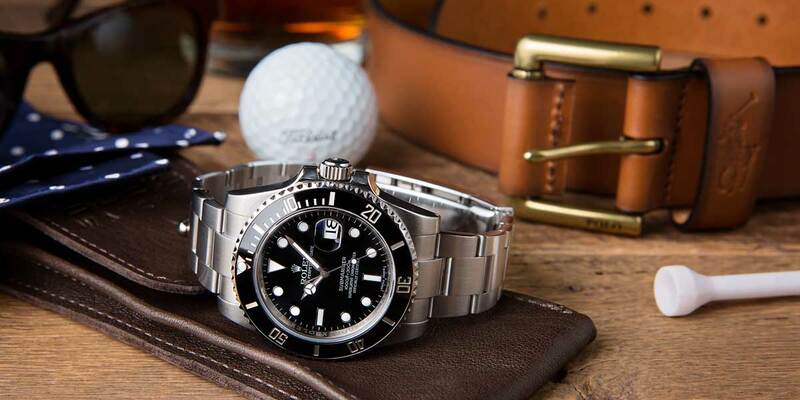 A Rolex watch is also a must have with many golf athletes favoring the Submariner or Explorer II. Despite a golf wardrobe filled with conservative clothing, it’s important to add a little individuality and pops of color to old-school style. Royal blue spiked shoes or a lime green polo are not forbidden fashion items. In fact, adding a few splashes of color can elevate a look from boring and basic to fun and fashionable. Don’t go overboard with the patterns and prints—just try one at a time. If you’re looking for a vintage Rolex watch, a well-aged GMT-Master can do the trick. It may sound unusual but adding a little bit of pastel, pink or purple can make a golf outfit more summer-friendly and give an otherwise commonplace sports attire a little pick-me-up. Try a purple polo with a pair of white khakis or opt for a pale pink shirt and gray slacks. For the truly daring golfer, consider a floral or tropical button down shirt for a round at the local country club. Whether you’re into the classic golf look or opting in for a look that is more casual, a Rolex will top off any look. A great go-to accessory and worn by golfing heroes like Tiger Woods.